Post is another passion of mine. I have sent thousands of painted envelopes & letters over the years, self made Postcards out of tea boxes, beermats or card cut out from packaging. 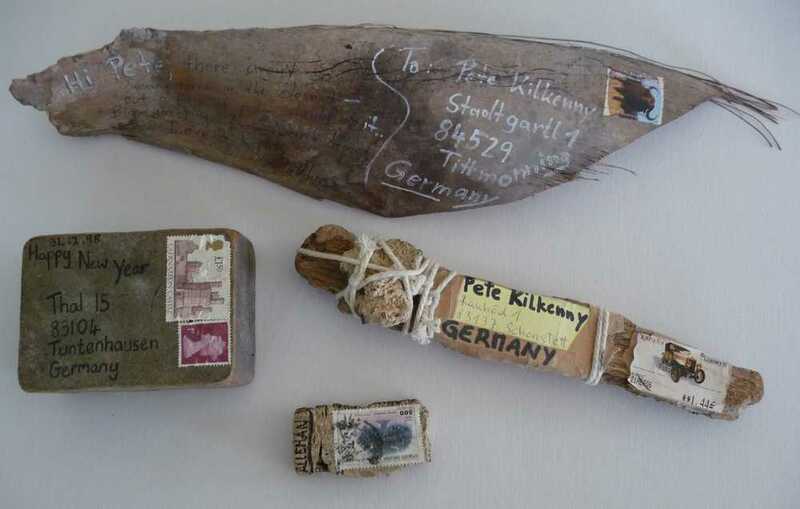 In the year 2000 I started to send unusual things through the post, the most unusual was a Teabag that I sent to my self from Ireland to my home in Germany, actually stamped and addressed on the Teabag itself to a friend of mine who was living in my house at the time. I posted it into the postbox just as it was though it arrived sealed in plastic which the Post Office in Ireland had obviously done to take care of it! It was about the same time that I started to ask people to send me pieces of driftwood through the post. I now have a collection of about 15 pieces from many different countries of the world.